Warm 2 bedroom condo with lots of room for your family to spread out and enjoy. Comfortably sleep 4-6 guests in our two bedroom home, with a King size master's, Queen size guest room, and Queen size sofabed in the living area. The kitchen comes well appointed with all the necessary amenities to feel at home. A large dining room easily seats six guest for delicious meals at home. 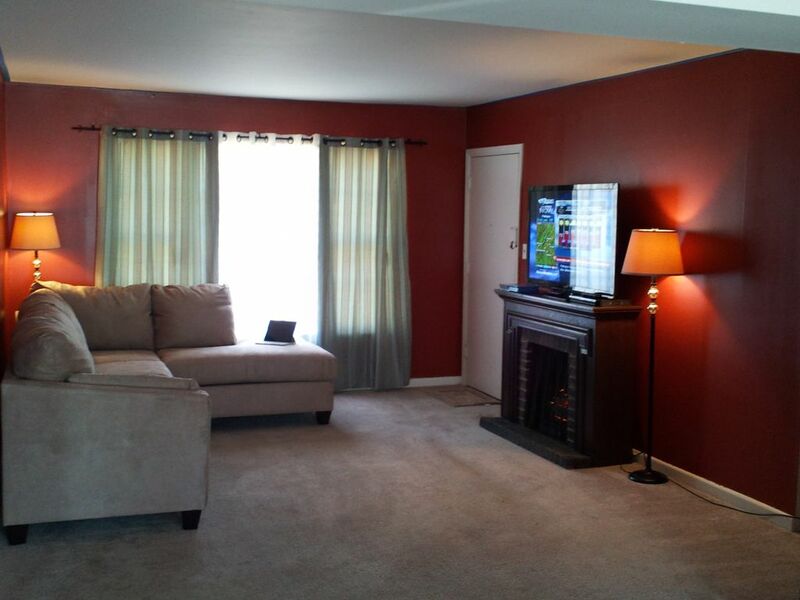 Definitely plan to warm up to the fireplace in the living area as you enjoy cable, DVD, and Blue-ray attractions on the 50+ inch flat screen TV. Allow each guest some down time as they enjoy DVD compatible flat screen TV's in each bedroom and secure internet service. We currently live in the Washington, DC area and visit Charlottesville as often as time will allow. Whether visiting for University of Virginia functions, athletic events, or down time from the big city, Charlottesville never disappoints. We may attend a football game or a polo match. We may shop at the many stores or picnic on the lawn. We may stroll the downtown mall or visit a nearby vineyard for wine and cheese. We may tour Monticello or reminisce on the Corner. No matter the agenda, we always head home discussing our next trip back. As a graduate of the University of Virginia, I have always dreamed of having a home in Charlottesville, Virginia. Even more, I look forward to sharing my wonderful memories of past and to come with others that visit one of the best places in the world. We have decorated the home in shades of orange and blue to help commemorate our love for this special place. Location, location, location...We wanted to make sure that you could visit the many wonderful destinations in Charlottesville without much effort. The University of Virginia is within two (2) miles. The historic sites are close by. Shopping and restaurants are right outside our door. The location is very convenient for any Charlottesville destination, and the home is renovated for your comfort to just relax, feel at home, and enjoy. Two (2) miles from the University of Virginia, within four (4) miles of the downtown mall, and surrounded by shopping centers & restaurants, this vacation home is poised to delight everyones appetite. The place was clean and in a great location. It had everything we needed. Well located home with easy access to UVA. The home was very clean and comfortable for our family. The owner provides kitchen appointments, towels, and linens. The Stonefield shopping center is right across the street with great restaurants and everything you may need during your visit. We would definitely book this home again. This vacation home was perfect for our stay in Charlottesville. We enjoyed visiting UVA grounds and other historic sites. The location was ideal for easy access to all that Charlottesville has to offer. The vineyards and wineries are second to none. We will plan to stay here again. Awesome stay. Close to UVA where we were competing. When we arrived, the air conditioning was not working & the temperature was 90 degrees. Unable to contact owner or VRBO; had to find lodging, expensive, elsewhere. Still waiting to hear about our refund. We own and manage vacation properties for more than ten years and make sure our guests are comfortable and enjoy our homes. Our air conditioning works and has never stopped working. This guest did not contact me until two days after arrival. Once I received her communication, a technician was sent to my vacation home within minutes and turned the air conditioning "on" within seconds. Unfortunately, this guest could not switch the "on" button to cool. If this guest would have contacted me upon arrival, the issue would have been resolved in a short matter of time. We make it our goal to respond to any and all guest as soon as possible. The VRBO website shows that we respond at least within an hour. Matter of fact, we responded to this guest immediately on each communication. We also went above and beyond with communication by responding timely, sending pages of helpful information to navigate around our home, and supplying additional research about activities in Charlottesville for this guest to enjoy. For this guest to suggest that she could not contact the owner or VRBO is just not true. Of course VRBO has 24 hour service for guests and owners. To go even further, I personally drove from Washington, DC to visit our Charlottesville home and make sure any issues were resolved. To my delight, the home is in good standing and will continue to bring joyful memories to our future guests as it has for more than five years. Please enjoy. The condo was perfect for 4 friends spending a couple of days in Charlottesville. Very well maintained, clean and has all the amenities you would need. Trent (the owner) was very responsive and provided great detail about the condo and things to do in the area. Would definitely stay here again! Graduation Weekend, Football Games, and other special events are subject to increased event pricing. Rates are subject to change without notice.